By Calen Henry. There's a bit of a doom renaissance going on. Bands like Crypt Sermon are carrying the traditional doom torch alongside the likes of Monolord and Elder; deep down the rabbit holes of their own sound. There's a bit of a doom renaissance going on. Bands like Crypt Sermon are carrying the traditional doom torch alongside the likes of Monolord and Elder; deep down the rabbit holes of their own sound. Meanwhile Khemmis, Pallbearer, and Dvne are pushing the boundaries of the genre by incorporating myriad other influences. Nate Garrett's solo doom outfit Spirit Adrift burst onto that crowded scene last year with the impressive and impressively traditional Chained to Oblivion. A year later, backed by a full band, he follows it with Curse of Conception. 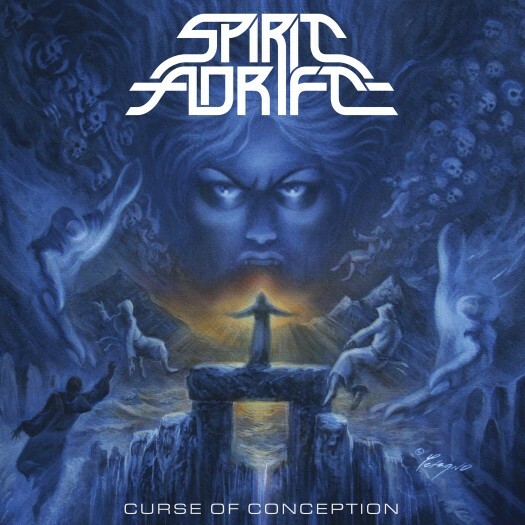 By sticking close to traditional doom Spirit Adrift show what's possible within its confines. The songwriting and playing are incredibly varied but extremely cohesive. In almost complete antithesis to bands like Monolord, Curse of Conception is a barrage of riffs, acoustic interludes, and dual guitar leads. Never really leaving the confines of doom, Spirit Adrift nonetheless push them. The varied tempos and searing solos edge into traditional metal territory but it always comes back to the doom. It's stand-out riff after stand-out riff; from the legato stomp of "Curse of Conception" through its major key change outro (also beautifully employed on "Spectral Savior"), into the very Pallbearer'y (and very excellent) intro to "To Fly on Broken Wings" and through the mandolin/synth intro on "Wakien". Then, saving the heaviest for last, the absolutely obliterating "Onward, Inward". The riff madness is all anchored by Garrett's soulful vocals. I initially found the vocals to be the album's weak point; Garrett isn’t the most technical singer but ultimately his vocals really complete the band's sound. They are mostly clean with just a bit of "grungey" grit and are delivered with absolute conviction. Like with many great bands, anything he may lack in technical skill is more than made up for in the commitment with which he sings. He sells every note. Fans of Khemmis and Pallbearer absolutely cannot miss Curse of Conception. Softer than Hunted, more traditional than Heartless and as crushing as it is gorgeous, it elevates Spirit Adrift to new heights making the doom darling duo a triumvirate. A traditional doom record this good in 2017, with such strong competition, is a jaw dropping achievement. Unless you hate melody do not miss this record.